Taken a couple of weeks ago when two of our Grand-children stayed with us for a night. Evan, who is five was born with the animal-loving gene that courses through our family starting with my mother. 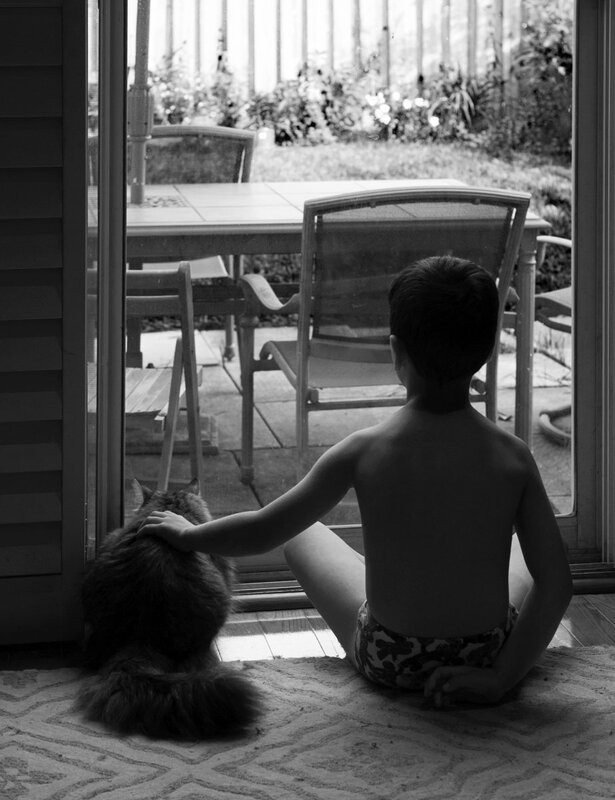 Early in the morning while one of our cats was sitting by the window eyeing the birds in the yard, Evan sat down beside him, and I grabbed this shot. Converted to black and white in Photoshop. That's the kind of photo that Evan will look back on when he is older and truly appreciate. I've taken a number of shots of Evan with the kitties (we currently have one but are baby-sitting our Son and Daughter-in-law's three while they have renovations done), so our home is Heaven for him, his sister and their two cousins who all have the gene, but not expressed quite as much as in him. Our daughter loves this picture, while our Son-in-law who is allegedly allergic to cats and refuses to allow pets in their home, does not.